1. Enas EA. High rates of CAD in Asian Indians in the United States despite intense modification of lifestyle: What next? Current Science. 1998;74:1081-1086. 2. Enas EA. Lipoprotein(a) is an important genetic risk factor for coronary artery disease in Asian Indians. Am J Cardiol. 2001;88:201-202. 3. Aro A, Jauhiainen M, Partanen R, Salminen I, Mutanen M. Stearic acid, trans fatty acids, and dairy fat: effects on serum and lipoprotein lipids, apolipoproteins, lipoprotein(a), and lipid transfer proteins in healthy subjects. Am J Clin Nutr. May 1997;65(5):1419-1426. 4. Wilcken DE, Wang XL, Greenwood J, Lynch J. Lipoprotein(a) and apolipoproteins B and A-1 in children and coronary vascular events in their grandparents. The Journal of pediatrics. 1993;123(4):519-526. 5. Enas EA. Lipoprotein(a) as a determinant of coronary heart disease in young women: a stronger risk factor than diabetes? Circulation. Jan 27 1998;97(3):293-295. 6. Lawn RM. Lipoprotein(a) in heart disease. Sci Am. 1992;266(6):54-60. 7. Loscalzo J. Lipoprotein (a): A unique risk factor for atherothrombotic disease. Arteriosclerosis. 1990;10:672-679. 8. Enas EA, Yusuf S, Garg A, Davidson L, Thomas J, Pearson T. Lipoprotein (a) levels in Indian physicians: Comparison with Black and White physicians in the U.S.A. Indian heart journal. 1994;46 suppl:185(abstract). 9. Superko HR, Enas EA, Kotha P, Bhat NK, Garrett B. High-density lipoprotein subclass distribution in individuals of asian Indian descent: the National Asian Indian Heart Disease Project. Prev Cardiol. Spring 2005;8(2):81-86. 10. Anand SS, Enas EA, Pogue J, Haffner S, Pearson T, Yusuf S. Elevated lipoprotein(a) levels in South Asians in North America. Metabolism. Feb 1998;47(2):182-184. 11. Gupta R, Kastia S, Rastogi S, Kaul V, Nagar R, Enas EA. Lipoprotein(a) in coronary heart disease: A case-control study. Indian heart journal. 2000;52(4):407-410. 12. Hughes K, Aw TC, Kuperan P, Choo M. Central obesity, insulin resistance, syndrome X, lipoprotein(a), and cardiovascular risk in Indians, Malays, and Chinese in Singapore. J Epidemiol Community Health. 1997;51(4):394-399. 13. Bhatnagar D, Anand IS, Durrington PN, et al. Coronary risk factors in people from the Indian subcontinent living in west London and their siblings in India. Lancet. 1995;345(8947):405-409. 14. Enas EA, Chacko V, Senthilkumar A, Puthumana N, Mohan V. Elevated lipoprotein(a)–a genetic risk factor for premature vascular disease in people with and without standard risk factors: a review. Dis Mon. Jan 2006;52(1):5-50. 15. Haffner SM, Gruber KK, Morales PA, et al. Lipoprotein(a) concentrations in Mexican Americans and non-Hispanic whites: The San Antonio Heart Study. Am J Epidemiol. 1992;136(9):1060-1068. 16. Enas EA, Mehta J. Malignant coronary artery disease in young Asian Indians: thoughts on pathogenesis, prevention, and therapy. 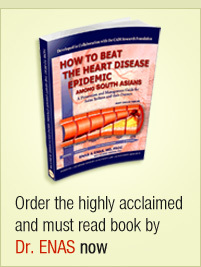 Coronary Artery Disease in Asian Indians (CADI) Study. Clinical cardiology. Mar 1995;18(3):131-135. 17. Enas EA. Why Indians are more susceptible to Coronary artery disease: Role of specific risk factors In: Chatterjee SS, ed. Update in Cardiology Hyderabad: Cardiology Society of India; 2007. 18. Enas EA. Why is there an epidemic of malignant CAD in young Indians? Asian J Clin Cardiol. 1998;1:43-59. 19. Bhalodkar NC, EA E. Malignant Coronary Artery Disease and the Asian Indian Paradox Proceedings of the 13th International Congress on Heart Disease Conference, New Trends in Research, Diagnosis, and Treatment 2007:157-164. 20. Banerjee D, Wong EC, Shin J, Fortmann SP, Palaniappan L. Racial and Ethnic Variation in Lipoprotein (a) Levels among Asian Indian and Chinese Patients. J Lipids. 2011;2011:291954.